The first step toward successful bird identification is knowing the basic parts of a bird. 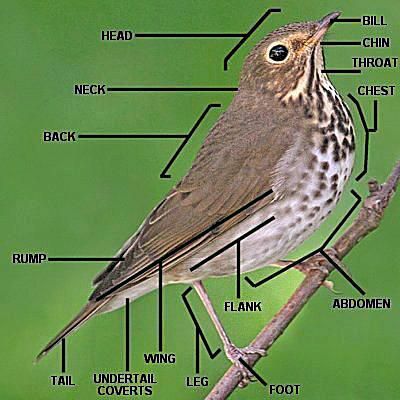 Thrushes have the most common, classic bird "shape" that is easily broken into all the key parts, each of which can be examined closely to help identify birds. Head: The bird's head is one of the best places to look for field marks such as eye color, malar stripes, eyebrows, eye rings, eye lines and auricular patches. The crown (top) and nape (back) are also key parts of the head that can help identify a bird. Bill: The size, shape and color of a bird's bill is critical for identification. Also check for any curvature in the bill or unique markings such as differently colored tips or bands. Chin: The chin, directly below the bill, is often hard to see on many birds, but when it is a different color it can be an exceptional body part to check for identification. Throat: A bird's throat may be a different color from its surrounding plumage, or it may be marked with spots, streaks or lines. Malar stripes may frame the throat as well, helping set it off from the rest of a bird's body. For many birds, the chin and throat have similar colors and markings. Neck: The neck of a bird is hard to see on many species, since it can be relatively short and insignificant. On wading birds, however, the neck is much more prominent and can be a good place to look for field marks. The length of the neck can also help distinguish different bird species. Back: A bird's back is often broad and easy to see in the right posture. Look for different colors and markings along the back that distinguish it from the neck, rump and wings. Chest: The chest (also called the breast) is the upright part of the bird's body between the throat and the abdomen. 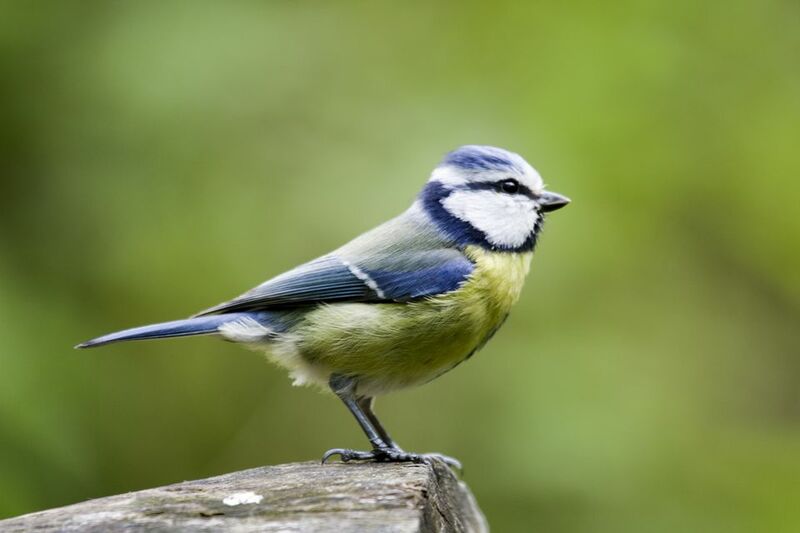 A bird's chest may be differently colored or marked with stripes, streaks or spots that can help with identification. Abdomen: The abdomen or belly of a bird extends from the bottom of the chest to the undertail coverts. The colors and markings on the abdomen may vary from the chest and flanks, making it a good feature to check for identification. Flanks: The flanks (sides) of a bird are located between the underside of the wings and the abdomen. In many bird species, the flanks have unique colors or markings, though depending on how the birds carry their wings, the flanks may be difficult to see. Wings: Birds' wings are their upper limbs used for flight. Wing bars or patches are useful field marks, as are the lengths of the wings compared to the length of the tail when the bird is perched. In flight, wing shape is also a great field mark. Rump: A bird's rump is the patch above the tail and low on the back. For many birds, the rump does not stand out, but some species show unique rump color patches that are useful for identification. Tail: The length, shape and colors of a bird's tail are important for proper identification. The tail can be held in different positions when the bird is perched or flying, however, and watching for different markings can help distinguish different birds. Undertail Coverts: The short feathers beneath the tail are the undertail coverts, and these feathers often show unique colors or markings that can distinguish bird species. Legs: Birds' legs vary in length and color, both of which can be useful field marks for proper identification. The thickness of the leg, while difficult to see on many species, can also be a clue, as can any feathering. Some raptors, for example, have heavily feathered legs that can be used to identify the birds. Feet: Many birds' feet are the same color as their legs, but not always. The orientation of the toes, the size of the talons and how a bird uses its feet are also useful identification characteristics. By learning the specific parts of a bird, you can learn to check those parts for field markings, unique colors and other distinguishing characteristics that can lead to an accurate identification of each species you see.